Even a moist roast turkey can seem a little chewy and unappetizing after a botched carving job. 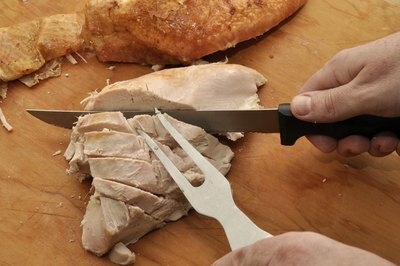 To serve tender, neat portions of turkey, it’s important to detach each section at the joint and then slice against the grain. This process is easiest when you carve each section in a certain order, using both a carving knife and your hands to separate the pieces. For better leverage, set up a kitchen counter with cutting boards rather than carving at the dinner table. 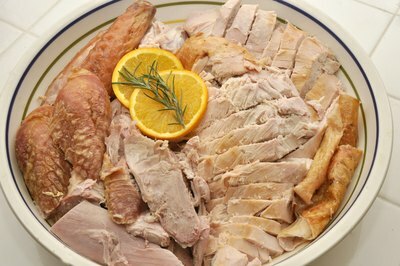 Place the turkey on a large cutting board with the breast side up. 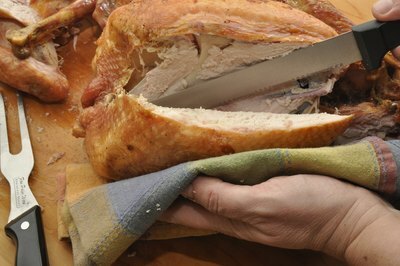 Have a second cutting board standing by to slice individual sections of the turkey. 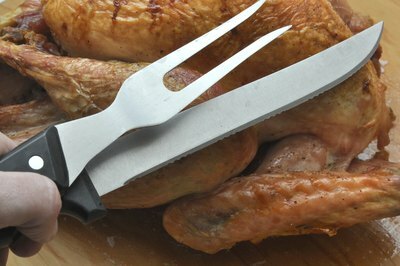 Slice straight down between the leg and the body of the turkey with a long, sharp knife, using a carving fork to keep the turkey steady. Pull the leg and thigh section away from the turkey until you feel the joint pop. Use a kitchen towel to protect your hands if the turkey is too hot. Cut down through the joint that connects the thigh to the carcass. Remove the other leg-thigh section in the same manner as the first. 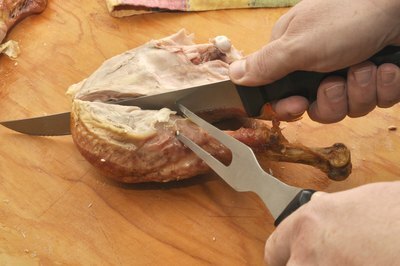 Separate the leg from the thigh by cutting down through the joint between them. You can use the tip of knife to probe for the joint if you are not sure where it is. 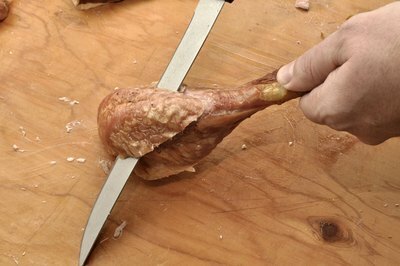 Slice the thigh meat by cutting parallel to the bone and arrange the slices on a platter. If you are serving the skin, you may find it easier to slice the skin separately and serve it on top of the sliced thigh meat. Stand the leg up vertically on the cutting board and slice downward along the bone to remove the leg meat. Transfer the slices to the platter. Alternatively, you can serve the drumsticks intact. Slice down between the wing and the breast. Pull the wing away from the body to expose the joint. 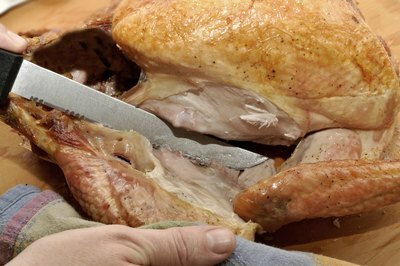 Remove the wing by cutting through the joint that connects the wing to the breast. Remove the other wing in the same manner and place both wings on the serving platter. Remove the breasts by slicing down along each side of the center breastbone until you hit the rib cage. Use your hands to peel the breasts away from the rib cage, and then run your knife along the bone to remove the breasts from the carcass. Slice the breasts crosswise to cut against the grain. Arrange the slices on the platter with the other pieces. 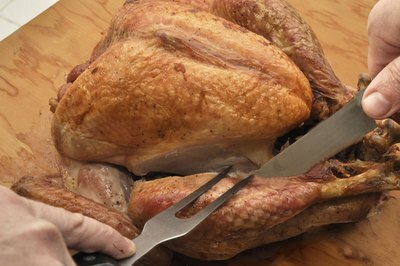 Learn how to carve Thanksgiving turkey breast for a traditional Thanksgiving Day dinner in this free cooking video.